While I (NIGHTSEA™ founder Charlie Mazel) was in Orlando, Florida, exhibiting at the XXV International Conference of Entomology (ICE), Derek A. Woller came by the booth. Derek is a PhD candidate at Texas A&M University in the Song Laboratory of Insect Systematics and Evolution, and his research group had purchased a light and filter glasses for hunting grasshoppers with fluorescence in the dusk/night, after meeting NIGHTSEA™ at the Entomological Society of America (ESA) conference in 2015. Derek said that he was organizing a grasshopper-hunting outing that evening and invited me to join. 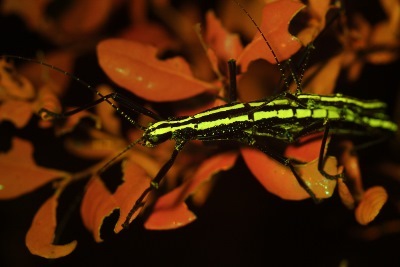 Hmmmm... a choice between a quiet evening at the hotel in Orlando or traipsing around the bushes looking for insect fluorescence in the middle of the night? No contest – I was on board! Fourteen of us left Orlando in three cars and about an hour later we stopped for dinner at Old Crow Real Pit Bar-BQ in Umatilla. A fine dinner was had by all and we were off to Derek's secret spot in Ocala National Forest, arriving around 9 pm along with a light rain. We geared up and headed into the bushes along with a 15th entomologist who met us there. Schistocerca ceratiola, common name rosemary grasshopper, is an interesting critter. Unlike most other grasshoppers, it lives only in association with one kind of plant, Ceratiola ericoides, common name Florida-rosemary (called that because of its superficial resemblance to actual rosemary). 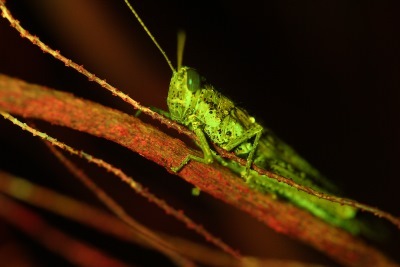 And while the plant has a wider geographic range, the grasshopper is only found in central and north central Florida. It is also unusual in that it is only active at night, when it comes to the outer surface of the bushes. Everyone else was a very experienced insect hunter, but the same can certainly not be said for me. I followed along making sure not to get separated from the group in the dark, scanning the bushes with blue light and yellow filter glasses, and moving in to take fluorescence photos, either when I found something interesting myself, or someone called me over. In the interest of full disclosure I have to say that blue light fluorescence was not the killer app for finding these grasshoppers. While they (and the plants) do fluoresce, the fluorescence is not extremely bright. I did find a hopper myself with fluorescence from a distance of about 5 feet (1.5 meters), but the others were finding plenty with white light and experienced eyes. Here is a fluorescence image I made of a grasshopper. The searchers found other subjects while looking in the rosemary bushes and I managed to get decent fluorescent shots of two species of walking stick insects. Notice the small male hitching a ride on the back of the two-striped walking stick Anisomorpha buprestoides. Fun fact: this white color morph only occurs within Ocala National Forest and Derek and the others had never encountered one before. 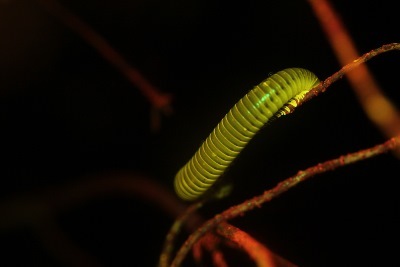 Millipedes did fluoresce brightly. I easily found several and managed to get an image. 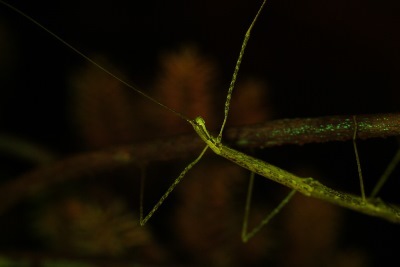 Note the brighter fluorescence of the legs. We arrived back in Orlando after midnight, tired, wet, and happy.